*Length units are for your reference-only since the value of the resulting lengths will always be the same no matter what the units are. Uses the law of sines to calculate unknown angles or sides of a triangle. In order to calculate the unknown values you must enter 3 known values. Some calculation choices are redundant but are included anyway for exact letter designations. To calculate any angle, A, B or C, say B, enter the opposite side b then another angle-side pair such as A and a or C and c. The performed calculations follow the side side angle (SSA) method and only use the law of sines to complete calculations for other unknowns. 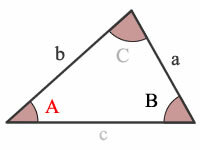 To calculate any side, a, b or c, say b, enter the opposite angle B and then another angle-side pair such as A and a or C and c. The performed calculations follow the angle angle side (AAS) method and only use the law of sines to complete calculations for other unknowns. Weisstein, Eric W. "Law of Sines" From MathWorld-- A Wolfram Web Resource. Law of Sines. Furey, Edward "Law of Sines Calculator"; from https://www.calculatorsoup.com - Online Calculator Resource.